Elematic FloorMES E9 ... designed to optimise hollow-core slab production. With Elematic’s FloorMES E9 programme, factories can be assured of smooth and continuous production while keeping operation costs low. 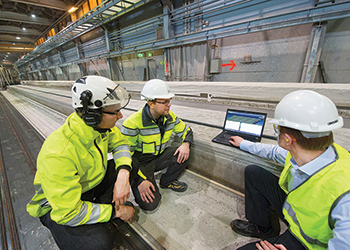 Elematic, a world-leading manufacturer of precast concrete plants and production lines, has launched a new manufacturing execution system FloorMES E9 that offers a complete solution to optimise hollow-core slab production. It developed the new software in close cooperation with precast factories, further cementing its strong know-how in precast production automation. The main objectives of the system are smooth, continuous production, and, as a result, low operational costs. “An uninterrupted casting process is key to our customers. Accurate production and machinery data enables corrections to possible deviations before any bottlenecks occur, while automated routines for production planning and monitoring help to improve productivity. This, in turn, improves business,” says Jarkko Salmensivu, automation and software product director at Elematic. Automatic monitoring is not typically done in hollow-core production, so the new execution system has a lot to offer in the field. 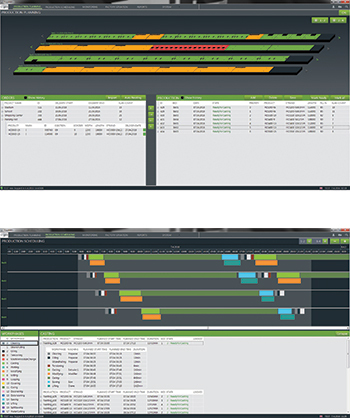 Production planning and scheduling (bottom) in the FloorMES. “We noticed that our customers tried to carry out production planning by using stopwatches and notebooks to improve production efficiency. This, combined with the rapid advance of technologies, inspired us to do our bit and develop a system that would automate the time-consuming planning and analysis processes,” Salmensivu says. Production planning will no longer mean manual work and piles of paper. Automation will accelerate the use of resources and the factories can make the most of what they have. The FloorMES E9 manufacturing execution system is a hands-on tool for production supervisors. It offers a single point of access to planning and monitoring precast floor production with an easy-to-use graphical user interface. Automatic key planning functions, and the possibility to make manual adjustments if needed, make production planning easy and fast. Extensive up-to-date status information about the production is easily available, and because the production history is automatically stored, it can easily be used for further process improvement. Automatic nesting places the hollow-core slabs in the casting beds optimally, and the system improves the processes and reduces strand waste. The centrally controlled system also ensures efficient control over the production machinery in the factory. Moreover, fluctuations in production that consist of elements with different difficulty levels can be evened out. Elematic is a world-leading manufacturer of precast concrete plants and production lines. In its more than 50 years of operation, the company has supplied technology to over 100 countries and to every continent. Elematic has subsidiaries and own sales offices in the US, Germany, China, Russia, India, Hong Kong and the UAE as well as agents in over 20 countries. The company headquarters is located in Akaa, Finland, and its production units are in Finland and India. Elematic holds an ISO 9001 certified quality system.